Want to buy the DVD and not have to wait for it to arrive to watch the film? After checkout you will immediately be given a unique code that you can use to claim your free rental on Vimeo’s website, here. 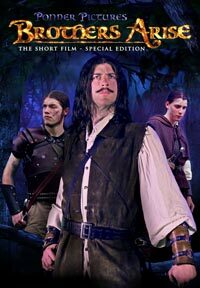 The BROTHERS ARISE (the short film) “Special Edition” DVD features a total of 87 minutes of original content! This “Special Edition” disc contains 60+ minutes of exclusive “Behind The Scenes” video footage, interviews, and commentary, that give you an inside look on how the film was made. This is an excellent resource for anyone wanting to learn more about filmmaking, the process, and all that goes in to a prodcution. If you or someone you know is wanting to become more involved in filmmaking you’ll find these “Behind the Scenes” featurettes both educating and inspiring! We put a lot of time and effort into developing the “Behind The Scenes” features for this DVD. The goal was to make something that was entertaining to watch, insightfully fun, and even educational. At the very least I think people will be greatly amused to hear some of the crazy stories that went on “Behind The Scenes” to make this short film. Beyond that, I hope people are inspired to dare to try the things and projects they’ve been dreaming about. For me, completing this DVD is major accomplishment… but working together on this project to produce a film… That’s my dream come true! And for that I’m thankful.